The next morning each of the four groups was hustled onto early morning buses to embark on their separate journeys. Our bus took us to the Weinviertel DAC where we learned a little bit more about the region and had an opportunity to taste through many wines not available in the US. Grüner Veltliner accounts for over 50% of the area under vine in the Weinviertel region and every quality wine producer in this region produces Gruner Veltliner. If you’re not familiar with the Weinviertel’s style think incredibly high acid, white pepper, green apple – all of the characteristics of Gruner Veltliner that would be qualified as “text book.” In the US, there isn’t a lot of wine imported from the Weinviertel in comparison to other regions, which is surprising given it’s style, but still you can find some excellent examples here. 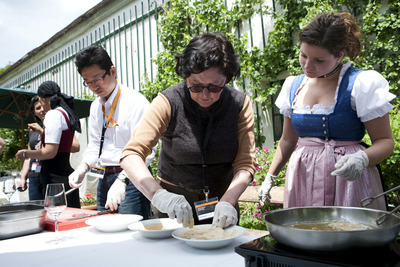 After our tasting the group piled back on the bus to go to what was a combined luncheon/schnitzel course at Schloss Mühlbach where the group of 2o or so had the chance to get in on the schnitzel making action (rumor has it that all the groups had this opportunity!) 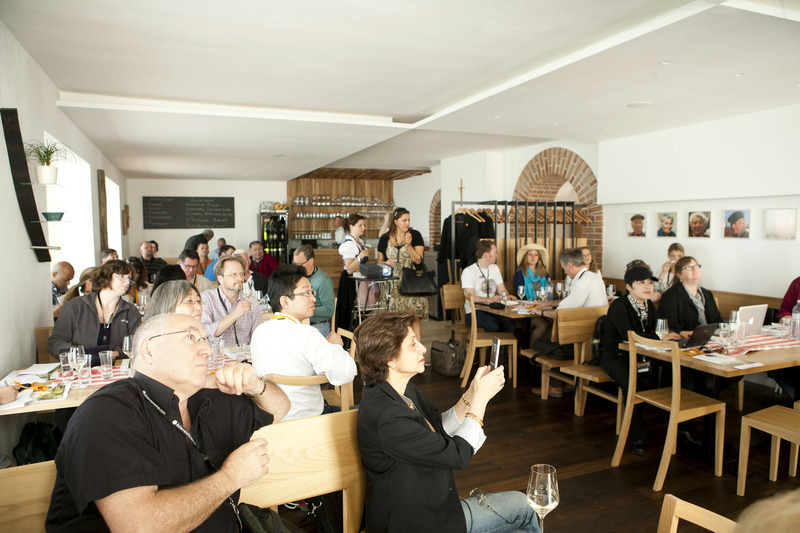 Accompanied by more wines from the region, including a few dessert wines, the group enjoyed traditional Austrian cuisine and then a special tour of the winery’s castle courtesy of the owners. Overall, a delightful afternoon. With full bellies and a happy wine experience we bid adieu to our gracious hosts and piled back onto the bus where our adventure continued to the Loisium Hotel in the Kamptal DAC.